Unique Ways to Expand Usable Living Space in Your Home | Turf Etc. Artificial turf is traditionally used in residential yards, indoor sporting arenas, putting greens, and even playgrounds. What many people don’t realize is that artificial grass can actually be the secret to unlocking extra usable living space in your home. Our team recommends installing artificial grass in unique spaces like roofs, decks and patios. This offers several benefits including safety, financial benefits and curb appeal. Our team has put together some of the best reasons to think outside the box when it comes to your home’s artificial turf installations. Apartment complexes, townhomes and single-family homes often find that artificial turf gives their space a unique look while adding usability to their living space. For example, apartment complexes with artificial turf on the roof can enjoy taking up their dog for a quick game of fetch without traveling up or down several flights of stairs. Single-family homes and townhouse residents can also enjoy a lightweight alternative to traditional roofing shingles. Additionally, homes, apartments and townhouses with open roofs with artificial turf serve as an additional space for entertaining! On warm Kansas City evenings and afternoons enjoy an outdoor party on your roof with artificial turf softly under your feet. Even better, artificial turf offered by SYNLawn Kansas City stands as the only grass product with a Class 1 fire rating making it safe to use in commercial buildings like apartments and housing communities. Your deck or patio is an extra living space used for play, entertaining, relaxing and enjoying nature. Urban patios, terraces and decks need a little sprucing up and artificial turf is exceptional for the job. First and foremost, artificial turf is easy to maintain. Whether your Kansas City neighborhood has been hit with a cold front or the hot season unravels with a vengeance, you can rest assured that the artificial turf on your deck and patio will withstand environmental conditions, require little watering and is safe for pets and kids to enjoy. Patios and small spaces in a front yard can be enhanced with the lush green look of synthetic grass. 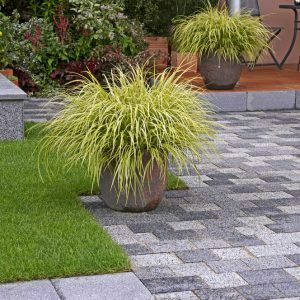 Oversized tile with turf peeking out gives a modern, sophisticated look to a walkway and can even be set to border above-ground planters and backyard spaces. Install a space on a deck or patio for a small putting green or simply relax in a clean outdoor space for your kids, pets and guests. Artificial grass patio turf and artificial turf in Kansas City are growing in popularity. This adds a unique look to a home, apartment or townhouse and can even enhance existing outdoor architectural features. Enjoy the simplicity of life with an easy to maintain space, expand entertaining spaces and use every square inch of your home to enjoy social events or just another lazy day outdoors. Contact us today to learn more!